Stand, white or gray laminated shelves. 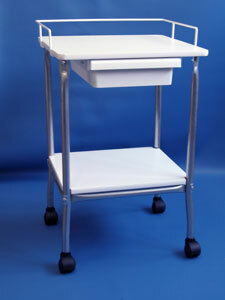 19\"W x 17 1/2\"D x 29\"H. Polystyrene drawer: 10 1/4\" W x 14 3/4\" x 3\"H. Includes wire frame on back and sides. 2" casters are standard, 3" ball-bearing casters, No. 075, are available at additional cost.